I apologize for the delay between posts. My real job has been keeping me very, very busy, and I haven’t had a chance to sit down and have enough time to craft a decent review, which this place definitely deserves. 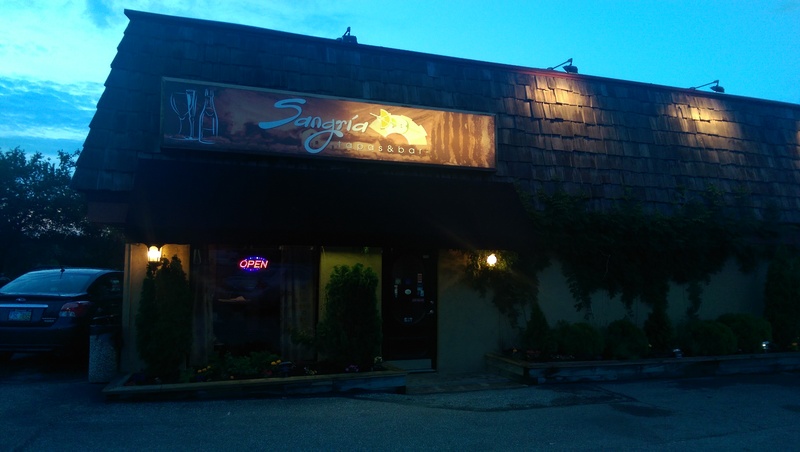 I first heard about Sangria y Tapas on a New Day Cleveland feature. I am a sucker for sangria and paella. Especially good paella. I quickly organized a dinner there with my dining out group. The more I examined the menu beforehand, I decided to eat my way through the tapas menu instead of ordering the paella. Everyone at the table ordered tapas that night, and we passed the dishes around and got to taste everyone’s choices. 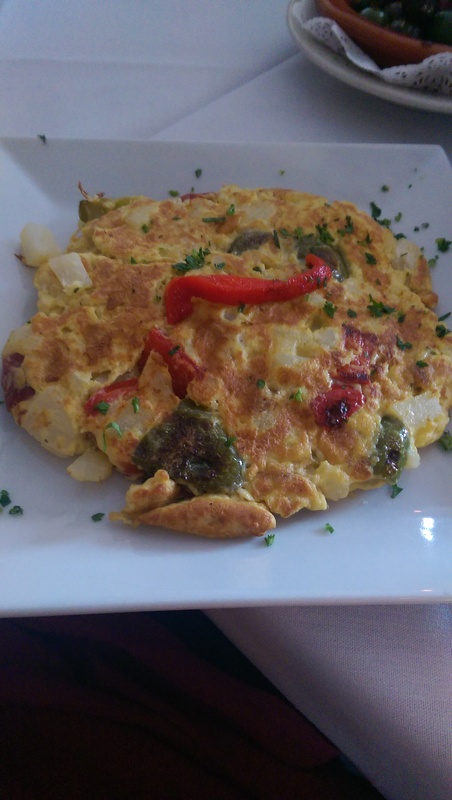 I went in determined to order the Spanish tortilla, which is a simple omelet of eggs, onion and potatoes, and a couple other small plates. We started off the evening with sangria. Oh, that sangria. 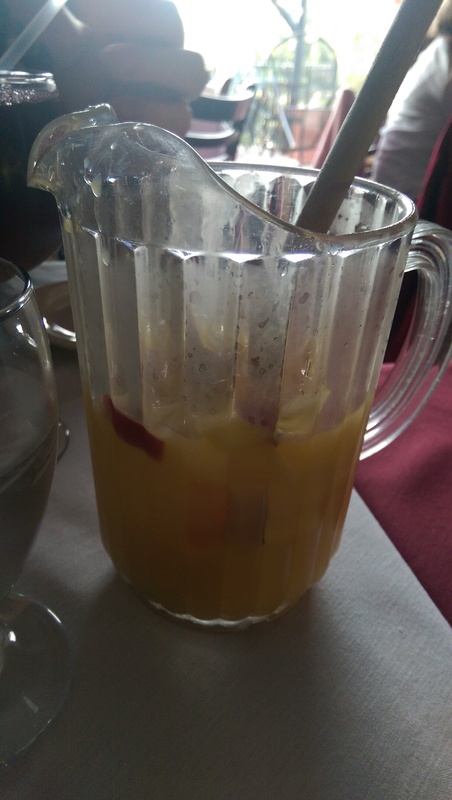 I ordered a half pitcher of the white sangria since most of my tapas choices called for a white wine. I loved every single drop. I got to taste the red sangria and the champagne sangria, and they were both great too (in fact on the second visit I ordered a single glass of the champagne sangria instead of a pitcher). 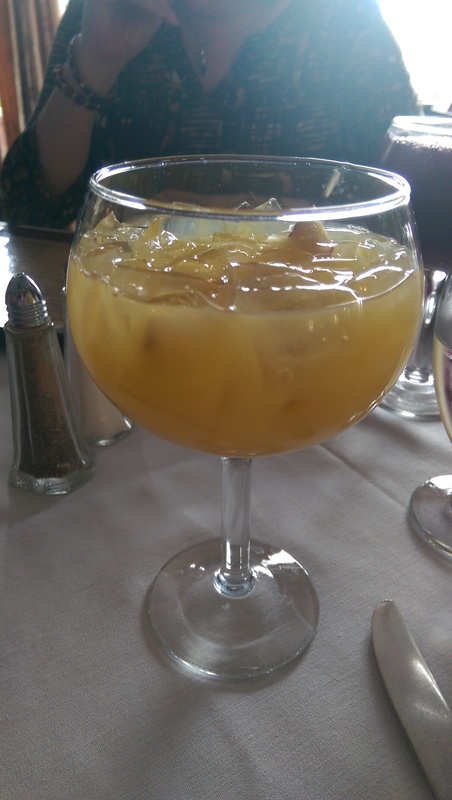 But I really, really like their white sangria. 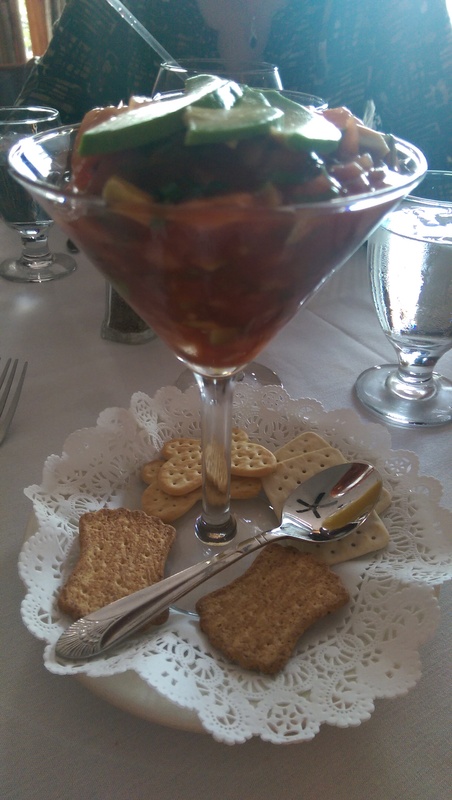 One of my friends used the straws like chopsticks to fish out the chunks of fresh fruit, which I thought was a much more elegant solution than sticking a fork or your fingers in. 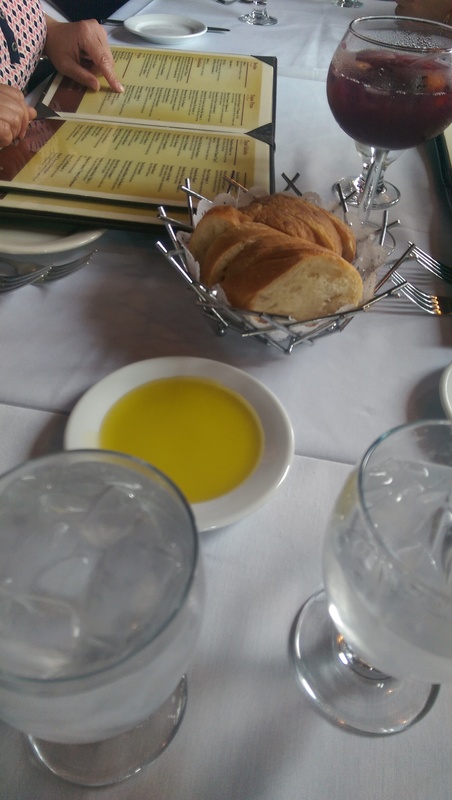 They brought out baskets of bread with oil to nibble on while we decided what to get. The bread was quite tasty, and if I remember correctly I believe it was from Blackbird Baking Company. The dipping oil was nice, but the oil was a little off on the second trip. I went a little overboard and ordered a lot of dishes. The Tortilla a la Espanola was perfectly cooked and was exactly as I expected it to be. Fluffy and flavorful with creamy potatoes. The Camarones a la Cancun (shrimp cocktail with avocado, cilantro and onion in a tomato sauce) was a little sweeter than I expected, but I enjoyed it. I wish it had come with a few more crackers, because I was left with a lot of tomato sauce left over once I ate the shrimp and avocado out of it. If you plan on ordering this save one or two pieces of bread. 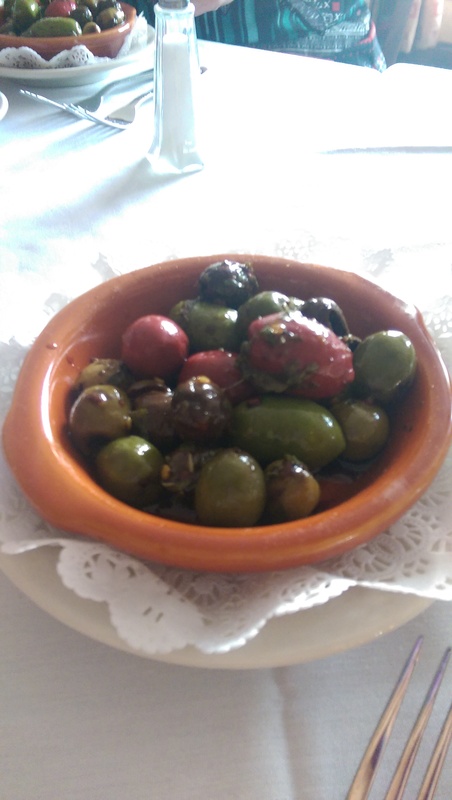 The Aceitunas Marinadas (marinated olives) were a delight. They had a kick to them from lots of balsamic vinegar. I ended up taking them home with the leftover tortilla and eating them for lunch the next day. I think they were even better the second day! I would definitely get them again. I also ordered the Vieras a Cebon (sea scallops stuffed with short ribs). I wanted to love them and they were good and perfectly cooked, but the other dishes were so flavorful that these were just kind of underwhelming. If you order them try to eat them first while your palate is still fresh. 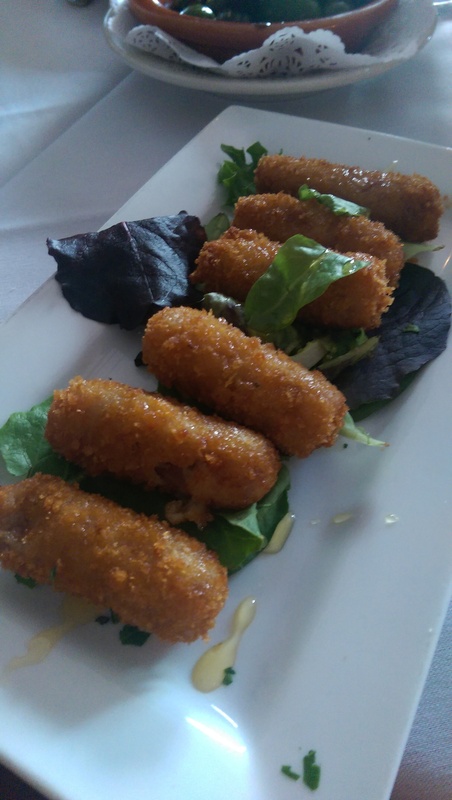 Another standout was the Croquetas San Miguel (potato fritters stuffed with serrano ham and drizzled with honey). The honey really complemented the fritters and was a great addition. I loved these! We ordered so many other small plates. 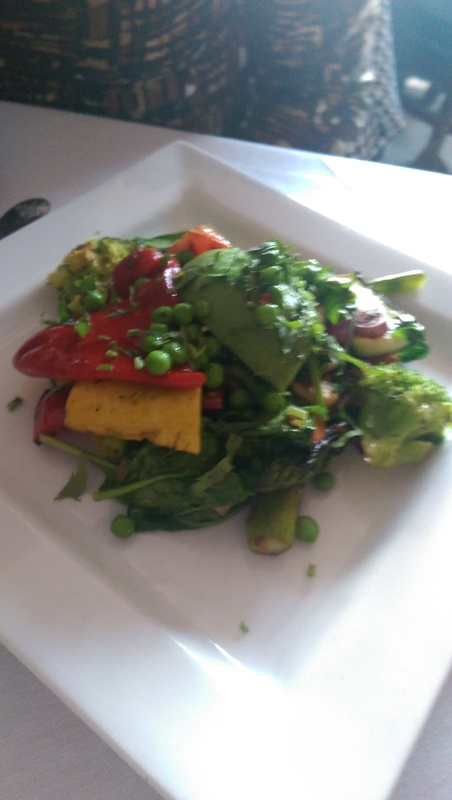 One of my vegetarian friends was thrilled with her Patatas Bravas (spicy potatoes), mushroom risotto, and the Vegetales a la Parilla (medley of grilled vegetables – pictured here). 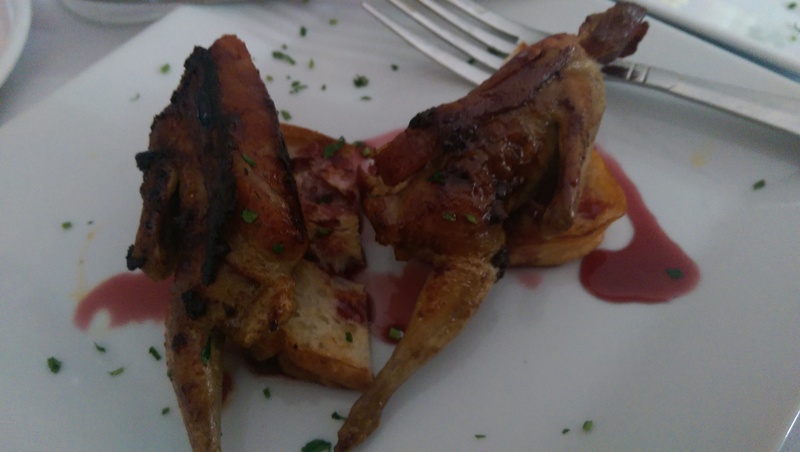 The bacon-wrapped quail, meat and cheese platter, and stuffed mushrooms with crab meat were also very well-received. The desserts were also amazing. They bring around a tray of all the available desserts, and diners choose. 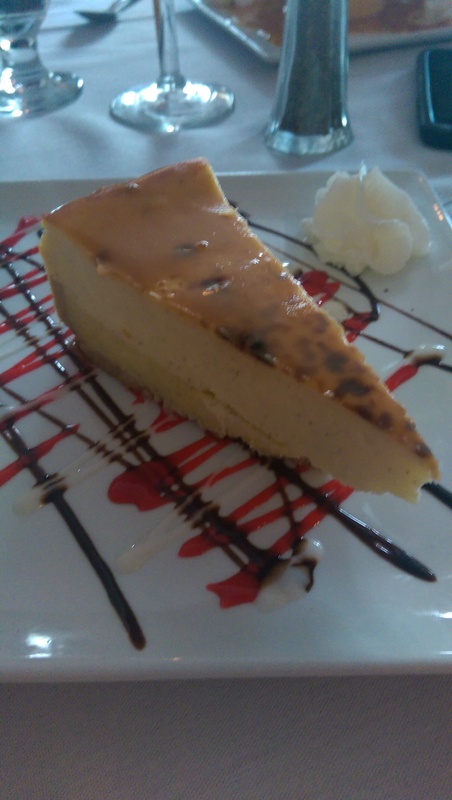 I ordered the creme brulee cheesecake, which was superb. 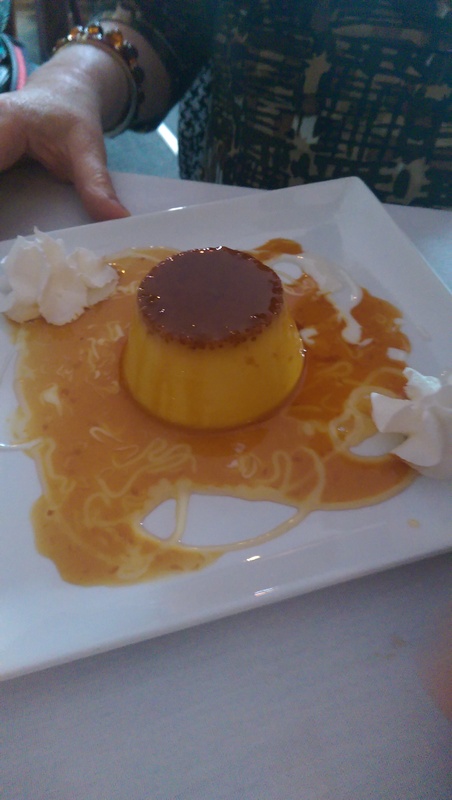 The flan was also a standout. Creamy and delicious with an amazing caramel sauce. If I remember correctly someone at the other end of the table ordered the Almond Cake, which was also delicious but was not photogenic by the time it came to me. 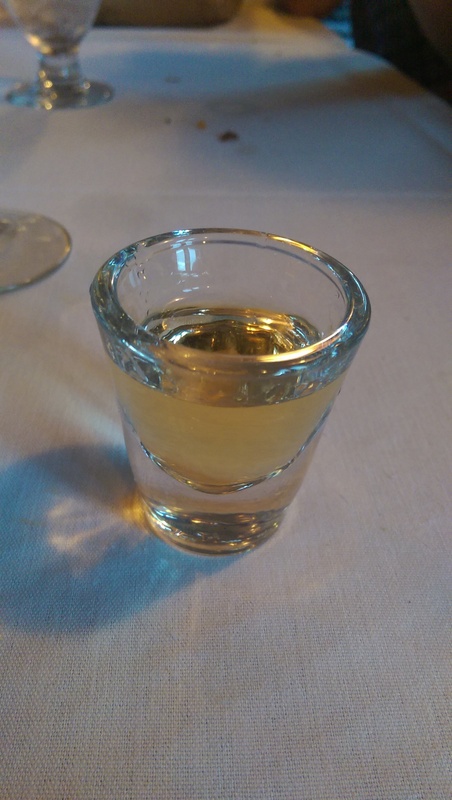 The desserts capped off a perfect meal, but one really nice touch is the complementary chilled almond liquor they serve as a digestif. They showed us the bottle at our request so that we could buy it to drink at home. It was really lovely. One thing that absolutely should not be missed is their Cafe a la Espanole. It is made with coffee, Kahlua, Grand Marnier, Bailey’s and whipped cream. It’s really a dessert in itself. They make it table-side, and it is a sight to see and delicious to boot. The sparks coming off the glass are great. Everyone was so thrilled with the meal that they were talking about coming back soon, which is something we never do. 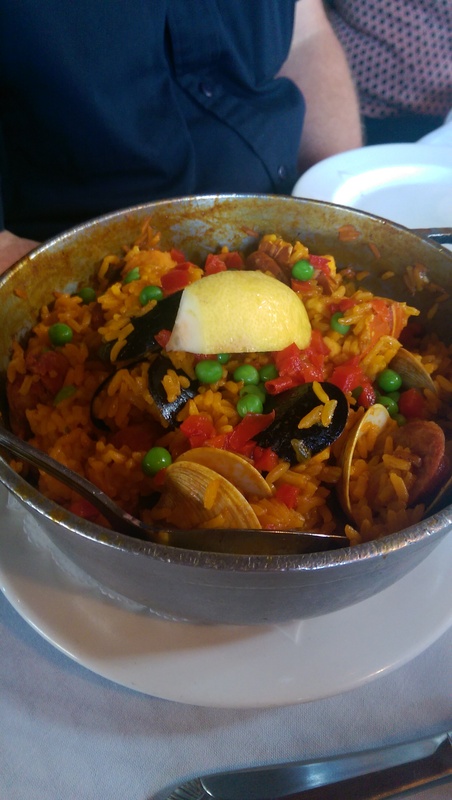 I scheduled a follow-up for Paella Valenciana a few weeks later. We had such a delightful time the first time that we were able to give the service a bit of a pass the second time. Even though I called to reserve a table and called back to add two more with plenty of notice they seemed surprised when we arrived. They were very booked up with a huge birthday party that day and a couple other larger tables had come and added people without giving them notice, so they were fairly in the weeds. They eventually managed to seat us together at one table after a bit of a wait and after bringing in tables and chairs from the patio (it was raining, so there was no one seated out there). The loud live music also wasn’t conducive to chatting, so we were happy that they moved us out of the main room to our final destination in a side room. Our waiter was noticeably overwhelmed, and I’m sure the kitchen was as well. He forgot to mention a couple of specials that one of our fellow diners would have ordered if she had known about it. We had already ordered when he approached a neighboring table and told them the specials, including the missing ones. 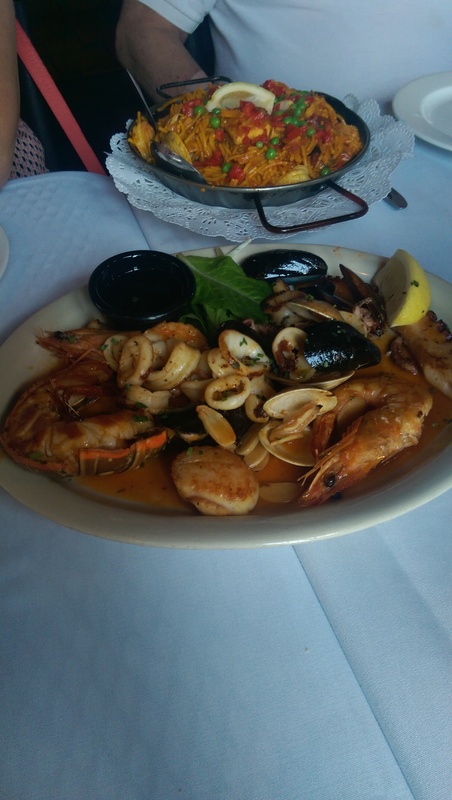 The photo below is the Seafood Special, featuring langostino, scallops, clams, calamari and mussels. Three of my dining companions split this as well as a couple other small plates and enjoyed it. The entree in the rear of the photo is the Fideuà, which is similar to paella but made with noodles instead of rice. Since the kitchen was in the weeds, our paella didn’t wow us as it probably would have otherwise. I enjoyed it, but some of my dining companions were less impressed. I will definitely be going back and ordering it again, because I just love paella and this was a very good version of it. I also enjoyed the leftovers the next day. Everyone was served a side salad, which surprised us. One salad came out without dressing (oops), but a side of dressing was quickly requested and brought to the table. We also enjoyed the housemade potato chips that apparently come with dinners. We all nibbled at the crisp chips, which were perfectly seasoned. I think they might have also brought a platter of vegetables to the table, but it never got down to my end. 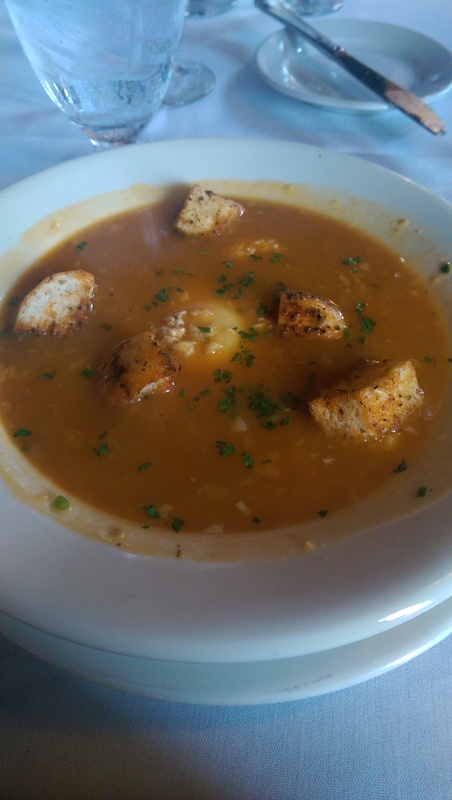 I also ordered the garlic soup and didn’t love it, but that might have been just me. There was a boiled egg in it acting as a kind of dumpling, and I am not a fan of egg since I’m allergic. I ate around it. 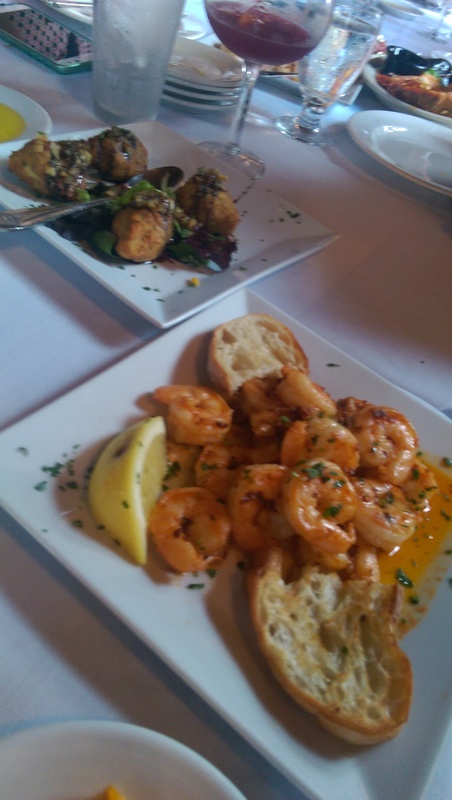 The overall consensus was that Sangria y Tapas is a hidden gem. 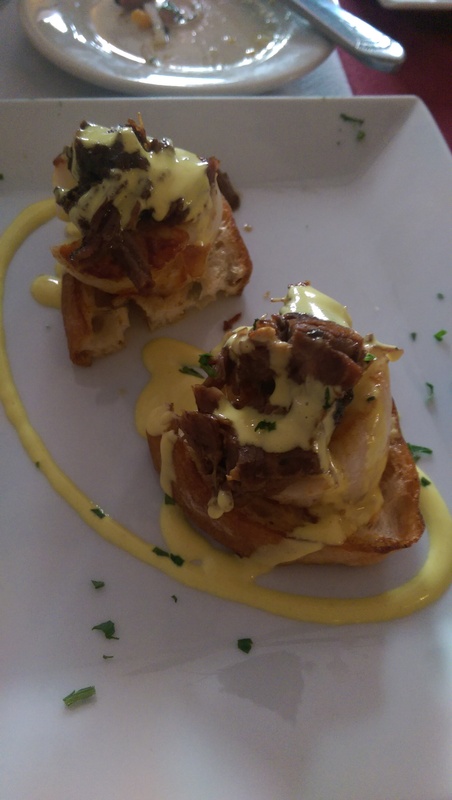 The tapas menu is extensive and has something for everyone. I highly recommend it! I only wish it were closer.